In 1986 there were 6 active chapters remaining in our 70 year old coeducational National Fraternity. Our Fraternity had been dying a slow death over the past four decades… the National Treasury ran on $5000/year. I was a senior at Millersville University and a member of the local chapter. About ten of us decided to attend the annual National Convention in November. At the 1986 National Convention, part of the business sessions included the formation and convening of annual National Committees. One of those committees was the Long Range Planning Committee, which was given the task of ensuring Phi Sigma Pi’s future by reactivating chapters that had gone inactive. I decided to chair this committee. I did not have a formal vision per se. I did, however, possess a clear realization the Fraternity was dying... and that something needed to be done to prevent this. I recognized that this was a fight for survival. I had a very high level of passion for the Fraternity. As I see it, when someone or something you love is in danger you do everything within your power to protect it. So, reactivating chapters at that time was the means by which we would save the Fraternity... more a survival tactic than a vision. chapters had been reactivated by May 1987. Steven was so impressed with my passion and abilities that he asked the all-volunteer National Council to appoint me to the role of Eastern Regional Director for the 1987-1988 term. My role was to carry the momentum forward with the reactivation and expansion efforts. For the next two years Steven and I worked as a team to do just that. Steven was elected National President in the fall of 1988 and I was elected National Vice President of Chapter Development. We ran the National Headquarters out of the basement of my parents' house. We both had a passion for Phi Sigma Pi that manifested itself as a “whatever it takes” attitude, even though Steven had a full-time job and I was in graduate school. Whatever was needed... making calls, driving long distances during weeknights, flying over weekends, stuffing envelopes, creating recruitment brochures and posters… Jeff and Steven were always ready and willing to volunteer for and take on whatever task was important for making Phi Sigma Pi a better organization. Together Jeff and Steven were able to accomplish things that would have been almost impossible for either one of them to do alone. However, more chapters meant more work for the National Council volunteers... more calls to take, more chapters to visit, more memberships to process, etc. Steven and I knew there would be a point where we could not physically keep up with the work needed to manage the existing chapters and at the same time continue the hectic pace of starting new chapters. 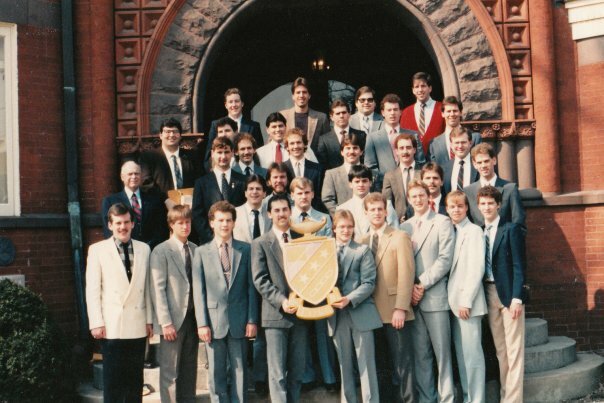 By the end of our elected terms in fall 1990, the active chapter count stood at 22. We had reached a point where we needed help. Steven had decided that after 6 years on the National Council he wanted to retire. I decided to run for National President. 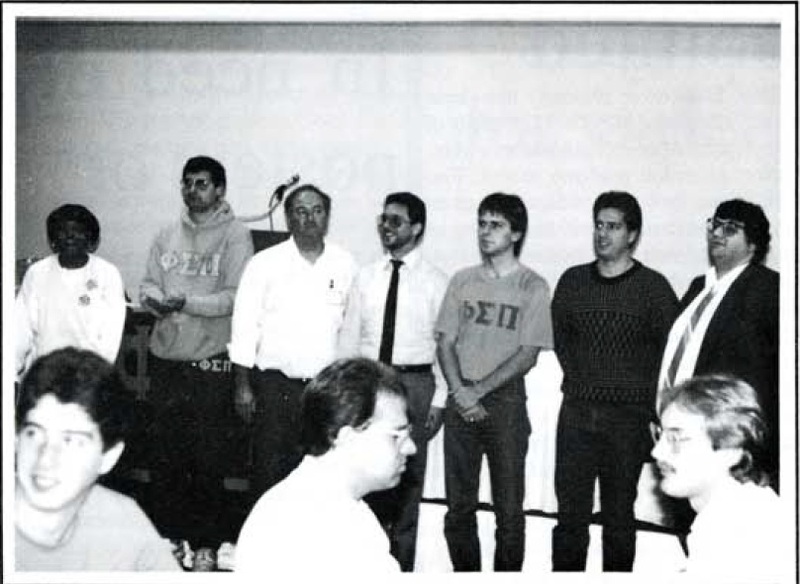 In fall 1990 I was elected to National President for the 1990-1992 term. Steven took on the ceremonial and supporting role of Immediate Past President. My primary objective during my tenure as National President was to build an organization that was not reliant on its volunteer National Council to do the day to day work of the Fraternity. For the sum total of its 75 year existence, the Fraternity was dependent on the ability of its volunteers to plan, call, travel, make, do, etc. It was an unreliable, proven to be ineffective structure. The all-volunteer National Council would then be supported by a professional Staff that did the work to make the planning and strategizing become reality, manage the day to day affairs of running the Fraternity and provide continuity and stability as National Council members turn over every two years. Fortunately, we had built the National Treasury to the point where we could afford our first full-time paid employee and an Executive Director was hired at the end of 1990. I served three terms as National President. I retired in fall 1996. However, through the early to mid-1990’s, Phi Sigma Pi grew at an average of 8 chapters per academic year. As the Fraternity grew, I led the charge to build a permanent National Headquarters. 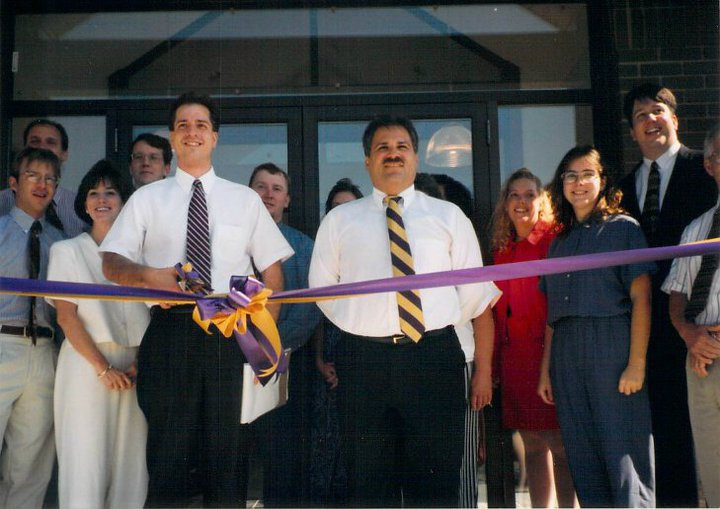 A site was located and purchased in Lancaster, PA. Plans were created to construct a building which could hold up to 20 Staff members and serve as the home of Phi Sigma Pi for years to come. Groundbreaking took place in summer 1995 and construction of the $500,000 structure was completed by summer 1996. Psychologically, the new headquarters was a rallying point for the Fraternity. Brothers gladly helped raise funds and made donations. The groundbreaking ceremony and open houses were unqualified successes. In a way, the new headquarters was symbolic. For the Fraternity it represented the final step in an 80 year nomadic journey for the National Fraternity... a REAL home of its own at last. For me, it represented my last major accomplishment as National President... the icing on the cake, so to speak. It stood as a symbol of the Fraternity’s newfound stability... and convinced me that my job was done and it was time for new leadership. 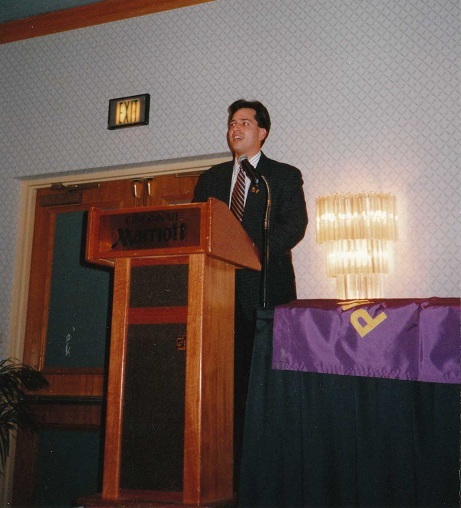 When I left office in 1996, Phi Sigma Pi had changed dramatically from the organization that was fighting for survival just a decade earlier. Phi Sigma Pi now stood at 70 active chapters and had a budget over $600,000. It possessed a state of the art National Headquarters, seven full-time National Staff members, and a rejuvenated, diverse Brotherhood. Jeff and Kim at the 2015 Grand Chapter meeting in Washington, D.C.
After taking a hiatus of about a decade to raise my young family, I began to re-engage the organization. In 2007 my wife and I established the Jeff and Kim Johnson Existence and Expansion Fund. This fund, currently growing and valued in excess of $80,000.00, is an investment in the creation of new chapters, a bulwark against existing chapters going inactive, and insurance that the entire Fraternity has the financial resources available to weather economic, geopolitical or natural disasters. In 2008-2009 I served as the VP of Finance for the Phi Sigma Pi Foundation. My responsibilities included, creating budgets, setting financial goals, and developing and implementing fundraising initiatives. Phi Sigma Pi continues to flourish today... and I continue to be one of its staunchest supporters.